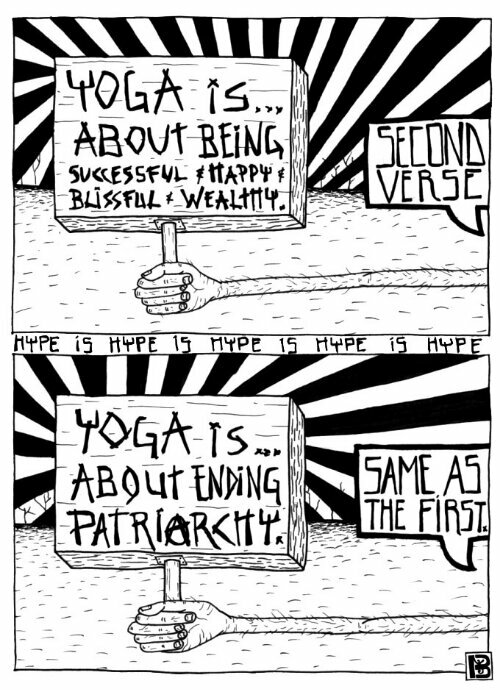 [DRAW POST] Wait, Yoga is About Revolution??? Welcome to our first ever Draw Post! Not having internet is making writing articles and posting them difficult. So, we decided to draw instead. Th only thing I know is that “Yoga is About.” As in “Out and About.” Like a crack ho in bangles with a fix to feed. Necessity is the mother of invention? This new cartoon motif may prove to be more fruitful than inventing elaborate cartoon characters of your own. Zen minimalism? Perhaps this attack on your Internet was a Saul-on-the-Road-to-Damascus lightning bolt.. You never know? The illustrations were a gift from an amazing illustrator. Each of the Five Magnificent created their persona based on who they “think” they are, and who I told them they were, and away we go.